This miniature dollhouse detail is a 1:12 scale moon pie box (empty). 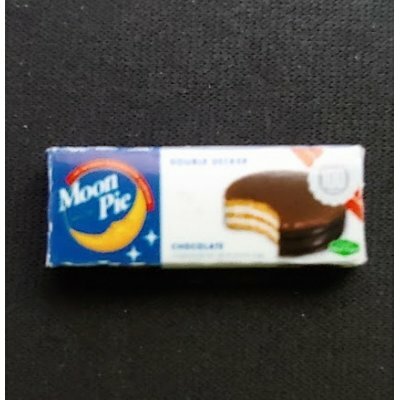 The miniature moon pie box is printed on all sides and measures 0.93" x 0.30" x 0.15". This Moon Pie Box is supplied by Cindi's Minis, which generally ships within 1 business day(s) of you placing your order . Cindi's Minis are hand made artisan dollhouse miniatures which are made in the USA. The quality and detail is sure to please. Cindi's Minis ship next business day.